Painting furniture can be a fickle process: chipping, bubbling, brush marks and uneven coverage are just a few of the problems that can affect the quality of your paint job. Ensure that you're using the best paint for your project by factoring in the material you plan to paint, the look you want to achieve, and how often and for what purpose the furniture is used. Using primer on your furniture projects helps the paint stick better and allows for better coverage. Primer is available in both latex and oil-based varieties. The type of furniture and how it's used helps you decide which type of primer to use. When painting finished wood furniture, an oil-based primer is the best option to prevent the finish or stain from bleeding. Oil primers also work better than latex primers when your wood is weathered or distressed or when the existing paint is cracking or chipping. In both instances, you need to prepare the furniture for priming by sanding the surfaces evenly with sandpaper. Clean the sanded surface with a cloth to remove any dust or dirt. Unfinished wood surfaces can be primed without being sanded first. Just wipe the surfaces clean with a cloth. While either oil or latex can be used on unfinished woods, oil is the best choice for a smooth and even foundation. The exception is furniture made of softwood, which is best suited for latex primer. A synthetic bristled paintbrush works for either type of primer. Let the first coat dry completely. Most primers dry within a few hours, but you can check your product label for a specific time frame. Once dry, lightly sand and wipe the surface clean. Repeat the process with a second coat of primer. Latex and acrylic are the main types of water-based paints, and both can be used on furniture. These paints work well on slightly porous surfaces like wood, stone and wicker and hold up through light to moderate use. Water-based paints normally require a primer coat and tend to show brush marks more readily. Latex paint is available in a wide range of colors. It comes in different finishes, such as flat, satin, semi-gloss and high-gloss. Flat paint is an option for furniture if you want a matte effect, but satin and semi-gloss are more common. High-gloss offers the most durability and is the easiest finish to clean. Choose your finish based on the desired look and how much use the furniture gets. Acrylic paint, unlike latex, is most often sold in small containers for craft use, making it ideal for small details and accents. Water-based paints usually feel dry to the touch in a few hours but can take up to 30 days to cure completely. Handle the piece with care during that extended curing time. Expect to apply between two and four coats of latex or acrylic paint to get full coverage. Oil-based, or alkyd paints, are an extremely durable option. They provide a rich, glossy, lacquer-like finish. Oil-based paints stick to most surfaces well, making them suitable for virtually any material. Oil-based paints are the way to go for furniture that gets lots of use or gets washed frequently. They're available in the same range of finishes as latex: flat, satin, semi-gloss and high-gloss. As with the latex finishes, high-gloss is the strongest and easiest to wash. Apply oil-based paints with a brush that has natural bristles, and expect to wait up to 48 hours for the piece to dry completely. These types of paints are more noxious than their water-based counterparts, and inhaling their fumes can be dangerous. Use them outdoors or in a well-ventilated area. Avoid contact with your eyes and skin, as it can cause irritation. Spray paint offers an alternative to brushes and rollers. This method eliminates brush marks that can be problematic with other methods. Spray paint also works well when you need to paint something with a lot of small detailing, curved or rounded areas, or spindles. Disposable spray paint cans are suitable for most small and medium projects, but they are relatively inefficient in coverage. Spray paint also comes in a limited range of color options, which can stifle your creativity. An alternative is to use a paint sprayer tool with your choice of paint. Airless paint sprayers work well with all paint, even thicker types. The machine uses high pressure to send droplets of paint onto the surface. Compressed air sprayers work with an air compressor to create a smooth, even coat of paint. This type of sprayer tends to use more paint and causes more overspray than other types. A high volume low pressure sprayer gives you a smooth surface because of the slower speed of the paint. Thicker paints don't work as well in the HVLP sprayers. Regardless of the method used, a certain amount of stray paint is inevitable when spraying, so be sure to cover the surrounding area with a tarp. Spray paint, like oil-based paint, should be used outside or in a well-ventilated area. Wear a face mask at all times to avoid inhalation of harmful fumes. If painting outside, avoid doing so on a windy day. The wind can make it very difficult to control the direction of your spray. If you're trying to achieve a specific style with your furniture project, specialty paints can help. Chalk paint is latex paint with a matte finish and strong adhesion and coverage. Its chalky quality lends a worn vintage effect that's perfect for a shabby-chic distressed look. 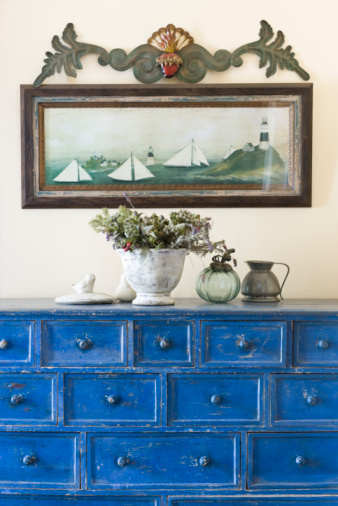 Crackle paint also works well with that style by creating layers of peeling paint for an antiqued appearance. Glazes are tinted transparent finishes that create depth and richness when applied over another paint color. Airen Meyer has been writing since 2006 and has been featured in publications such as "The Pantheon" and "The Independent Collegian." She currently resides in her hometown of Toledo, Ohio, where she studied at the University of Toledo.